1) How do I create my account ? select the Sign up link. you need to register your name, desired ID, e-mail address, and your home address. your registered user ID canc be up to 12 characters please use only letters and number. 2) If your registration attempt is failing, You can try another below. It is most likely because you tried to register with a duplicate ID, a duplicate E-mail address, or an invalid E-mail. You can try "Forgot Password". 1) How do I change my password ? Sign in to your account and enter your desired changes, then click the "Submit" button. Changes take effect immediately. 2) How do I change my ID ? Send an email We willl get back to you as soon as possible. then membership will be immediately cancelled. 2. Handled contents for withdrawal from membership. (1) Accumulated points : Item refund or deposit for advanced payment will be refunded in full. (Exception : Points given due to events or item purchases won't be refunded). (2) None-used discount-coupons won't be valid after the withdrawal from membership. (3) Based on the article 6(the preservation of transaction record, etc) of the Consumer Protection Law and the law's enforcement ordinance article 6, We keep the records for the followings. * 5 years for contracts or subscription's withdrawal. * 5 years for payment and record about supply of goods, etc. * 3 years for consumer complaints or dispute settlement. * Personal information won't be used for other purposes unless it's for a legal purpose. * Please note that the above issues are based on the Korean Consumer Protection Law. 3. Management of postings when withdrawing membership. On shipping This means "Shipped order". We shipped already and you can see the tracking number in the order detail. Shipment completed If you received the order already, please click the "received" button at [Order Status - Received]. Order cancelled If you cancelled the paid order by yourself. We will check your payment and will refund all your money in 2 business days. If you want to cancel the unpaid order, please contact us at thelees.cs@gmail.com. Or, you can just ignore the unpaid order. Pay Back This means that we refunded your order fully. You can look for what you want by typing name of items in the Search Box. Second. After you add the last item to your bag, Simply click "Pay now"
Step 1. Check the list and click "NEXT"
Step 2. Fill out the detailed delivery information and click "NEXT"
Step 3. Confirm the total and order number and click "Checkout with Paypal". 1. Point : This is cyber money which can be spent on TheLeesshop and 1 point is the same as $1. When you sign up, 1 point is given basically. Over 1 point can be used. (2) Leave feedback helpful to others : Whenever you leave Feed-back with your height, weight, and size of goods, 1% of point under a item is given. 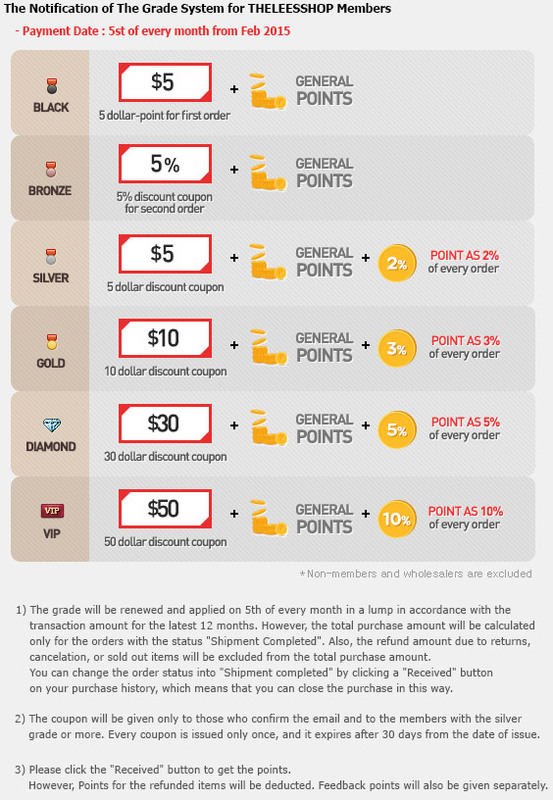 Also, if you leave it with a picture(s), additional 2% of points are given(total 1+2=3%) For instance, if you purchase a 50-dollar shirt, 0.5~1.5 point, which is 1~3% of the price, is given. when you leave feed-back with a shot in goods, 1 point, which is 2% of the price, is given additionally. As a result, you can get 1.5~2.5(0.5~1.5+1) point. amount is given to your account. A person who recommend many friends who purchase items can get many points. * For example, if you recommend 10 people and they buy as much as $100, you can get 20 point (2%x100x10). 3. This event is for members only and overlap usage is possible(exclusive of wholesalers). 1. We ship all over the world. Just buy and enjoy our great service, we ship directly to your door. 2. Our handling time is 1-3 business days after your payment has been processed, a tracking number will be provided to you after that. Shipping fees depend on the weight of your items. We charge very low shipping fees for our customers to save you money. After shipping out, we will change a status of your order to on shipping with a tracking number. If you chose a fast mail service, your package is shipped through DHL, FedEx, or EMS of post office with a tracking number. You can track where it is or when you can get it with the number. After shipped out, you can receive it (with)in about 2~5 days. If there, however, are any problems in the customs, delivery would be delayed until you pay for taxes or contact the customs. To track your package, please refer to one of the following URLs. If you choses standard mail service, the package is shippped through a post office with a tracking number, you can, however, track whether it was shipped or not. Also, It would take about 7 ~ 20 working days until you get it. If it isn't delivered to you even though you awaited the period of the time, please contact us with your transaction number. We can then ask the officer to investigate it. "Do I have to pay tax on orders I buy at theleesshop.com?" Tax is a very complex issue, and varies from one country to another. Some countries are easy to import goods into, and have few restrictions and no taxes. Other countries are incredibly restrictive and have high import taxes. Before you start to import larger quantities of South korea goods to your country, you will need to research what the law and import practices are in your country (or for the specific destination countries that you are dropshipping into). Please read the following notes for some basic background. There are absolutely no sales taxes or any hidden charges to pay on the South korea side when you buy goods at theleesshop.com. However you may to pay some taxes on your local side when you received the goods. When you are buying from South korea, and the goods are delivered to your country, this is importing. The exact process in receiving goods will therefore usually be different from buying mail order products from online stores within your country. Whatever goods you order from theleesshop.com, we will ship to you. We will not enforce any rules so it is up to you to make sure that what you are purchasing from us is acceptable to be imported into your country. Many countries charge two kinds of tax when you import from overseas: sales tax (VAT) and import duty. Generally, these two taxes are not very high and the payable amount of tax is based on the declared value of the goods (and occasionally the shipping). Conversely, many countries do not charge any tax on certain types of goods, or on shipments which are small enough. Usually, importing large quantities of goods from overseas is strictly controlled by your country's Customs, but smaller quantities can be imported more easily. The exact definition of “large quantity” and “small quantity”, often defined by a value “threshold”, varies from country to country. The term “ad valorem” in import taxes means that the tax you have to pay is calculated as a percentage of the total value of the goods (and sometimes the shipping cost too). Obviously there would be an advantage to declare the value of the goods lower in such cases. This is known as “under-declaring” the goods and is not permitted, despite being a widespread practice. Any customization you request from us in regard to declaration value on the shipping paperwork is at your own risk. The category and type of goods you are importing often has an effect on whether you have to pay tax, or how much. Obviously, certain categories of dangerous or restricted goods are illegal to import in most countries. Other specific restrictions on certain items such as spy cameras and jammers may also apply in your country. Please carefully research the relevant information for your local country. The declared contents of a package must be true and accurate for Customs purposes. Any customization you request from us regarding the declaration value and information of packet contents is fully at your own risk. We accept PayPal, credit card, T/T, Money order as the payment methods. After sending your payment, a payment confirmation message will be sent to your registered email address from TheLeesshop. If you place an order including "Dropship Item" together with other items, "Dropship Item" will be shipped and delivered separately with different tracking numbers. Orders are only handled and shipped from Monday to Friday. If orders are placed on non-working days, it'll be handled on the next working day. Also, you can receive your items after handling time plus shipping time. You can track packages with provided tracking number. Please be advised that buyers can be imposed taxes, duties, and customs fees for international shipments in the local currency in the course of the customs clearance or at the time of delivery. By purchasing on TheLeesshop, we consider buyers have understood and agreed to pay for any tax, import duty, VAT, or other customs fee which is levied by a importer's government or the customs office. Therefore, if you refuse to receive your package due to the taxes, you can't get a refund for your order. Tax rates vary by country or what is ordered, so we can't estimate an extra cost. For further information about the customs policies of your country, you can contact your local customs office. Please make a return request by emailing us prior to returning of the item(s) within 7 days after receiving your items. Item(s) should be returned unworn, unwashed, and undamaged, with all tags attached. Upon receipt of your return, we will inspect your returned item. Return shipping fee and exchange's shipping fee will be the buyer's responsibility unless you received different item/size/color, or defective Item. If item(s) is returned for a refund, the initial shipping fee will be deducted from the refund amount unless the return reason is our responsibility.